A small idea which just came to me while musing on the possibilities of an "anything goes" mashup D&D setting. 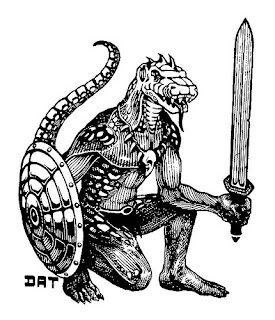 I've actually never come across a playable lizard-like race in D&D before. Reptiloids are members of various reptilian humanoid races. They are typically of average human height and build, with scaly skin of varying hue (often greenish). Reptiloids are strictly carnivorous, and have a natural bite attack which causes 1d6 damage. They have a very powerful sense of smell, which means that they are only surprised on a roll of 1. Reptiloids have a natural armour class of 7, due to their scales, and gain a +4 bonus to saves versus poison. Four types of reptiloid are described below. Gullygug: Not strictly a reptile, but close enough, gullygugs are a race of amphibious frog-men. When lightly encumbered they can swim at their full movement rate. They can make a hop attack, jumping up to 15' forwards and gaining +1 to-hit and +2 damage if using an impaling weapon. Gullygugs can breathe underwater for 10 minutes. In dry environments gullygugs suffer -2 to-hit unless they have a source of water available to wet their skin. Lizard-man: A brutish and cruel race of scaly humanoids, with the heads and tails of lizards. Their jaws are especially strong, and inflict 1d8+1 damage. Snake-man: An only vaguely humanoid race, with a long serpent body and tail in place of legs, a snake's head, and human-like arms. They may attack with their tail, attempting to coil around an opponent. Constricted opponents suffer 1d3 damage per round and -2 to-hit. A snake-man's tail also allows him to coil around pillars and such. Due to their unusual form, snake-men cannot wear normal humanoid armour, and must pay double when purchasing armour. Yes, Cornish coastal caves. I am 100% sure these must have been used for smuggling! Definitely. 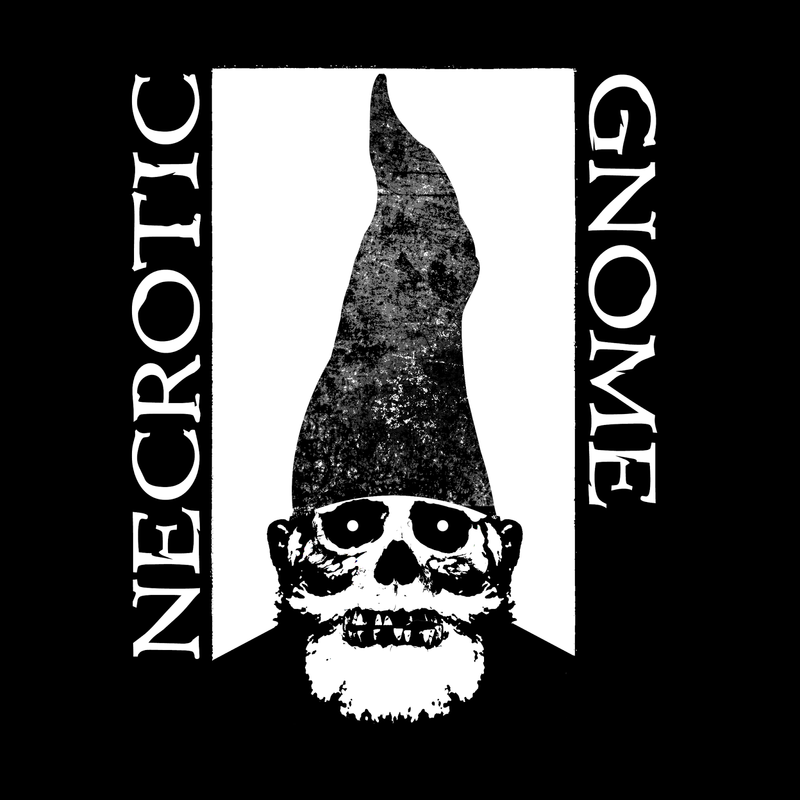 Over the last month I've been posting some extracts from the custom D&D rules, based on Swords & Wizardry, which I've been tinkering around with, planned for use in a future campaign. I've now got the document to a point where it feels more or less finished. It's still very much a draft -- I've not given much attention yet to layout, and certain sections are open to modification or expansion (for example, I want to add more alchemical and herbal items in the equipment list). The basic structure of the rules is there though. Players' setting guide: a broad map of the campaign area, and some basic information about different regions, the people and creatures which inhabit them, and some cultural / historical information. Saints & Shrines: for use by players of Zealot characters. Describes a pantheon of saints, and the miraculous blessings which are purported to them. The location of the shrines of some of these saints is described; others must be discovered through play. Theorems & Thaumaturgy: details a set of magical tomes, arcane libraries and arch-mages, which provide the initial spell selection of Magus characters. Referee's setting guide: a proper hex map and descriptions of the hex contents. I've uploaded the rules booklet as a google doc. An interesting post from Mike Mearls over at the WotC site about magic items, and the first thing I've read about D&D Next which sounds 1. really awesome, and 2. actually a refreshing and original approach to something*. I especially like the idea of the random table of background snippets about magical artefacts. Yes, a very cool idea! * and not a rules changes, simply a change of perspective and emphasis. Edit: Just to be clear on this, I'm not saying I think I'll ever buy or play D&D "Next"... I just think their emphasis on making each magic item something unique is really cool. 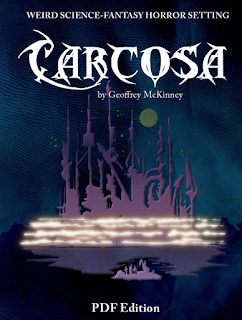 I've been preparing to run a Dying Earth-esque game tomorrow, and it occurred to me that it wouldn't be a huge stretch to do a Carcosa / Dying Earth mash-up. Following the Magus, Fighter and Slayer (Zealot / Defender / Champion ... still undecided), last up in the roster of classes for my future D&D campaign is the Adventurer. As the Adventurer class is so tied to the simple skills system of the game, I've also pasted in the section which explains how skills work. 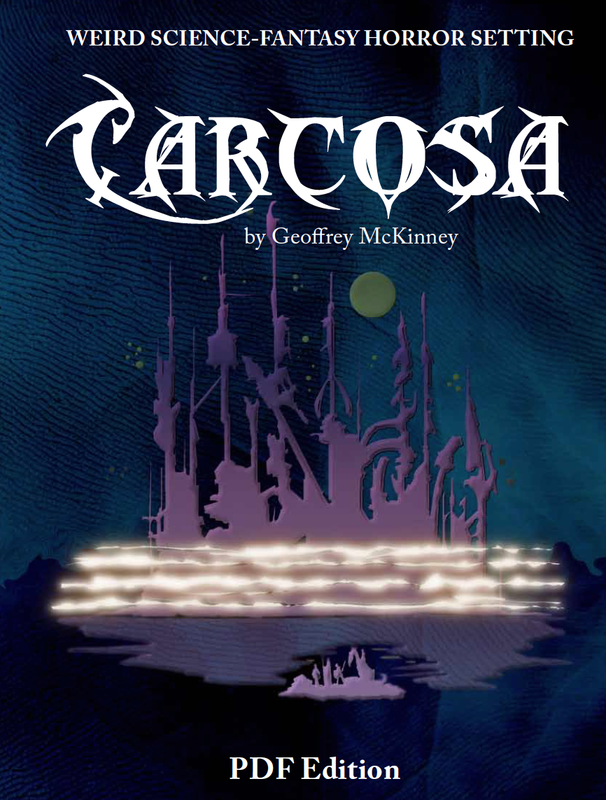 This is, of course, heavily inspired by James Raggi's Weird Fantasy RPG. As in that game, a character of any class with at least a 1 in 6 chance of success with a skill can attempt to use is. Adventurers are, however, the only characters who can actually improve their skills. Note the addition of some bardy, rangery and assassiny skills. Also note, again, that the class gains a unique (i.e. unavailable to other classes) bonus based on its prime requisite, Dexterity in this case. ps. Sorry the formatting below is a bit odd. I just pasted it in from the rules document, and it's not survived the transition that well. You are a wanderer and a rogue, following wherever the road leads and the next adventure is found. Whether a dashing duellist or highwayman, a professional thief, or a wilderness ranger, you live by your sword, your wits and your manifold talents. While Fighters may exceed your ability in combat, and other characters wield power over supernatural forces, your forte is in the mastery of the skills essential to a life of adventure. XP Modified by Dexterity: The Dexterity Modifier applies to XP gained by this class. Saving Throw: Adventurers get +1 on saving throws vs. traps. Weapon/Armour Restrictions: Adventurers are able to use any type of armour and weapons. However, they favour light weapons which allow a quick and agile fighting style. Adventurers suffer a -1 penalty to hit when using two-handed melee weapons, heavy crossbows, longbows and muskets. Agile Fighting: Adventurers tend to favour light weapons and armour, preferring to rely on swiftness of foot and blade to avoid harm in combat. When wearing leather armour or brigandine, they gain an AC bonus based on their Dexterity score. Adventuring Skills: As specialists in subterfuge, audacity and derringo-do, Adventurers are able to excel at a wide range of abilities which can aid them in their trade. An Adventurer gains four points at 1st level to add to skills of his choice, improving his chance of success. Each point spent adds a 1 in 6 chance to the skill succeeding. Adventurers receive two additional points with every level gained thereafter. The following skills are areas of expertise which are commonly useful in adventures. All skills are handled with a simple d6 roll, with lower values indicating success. Some skills can be attempted by any character, and have a base 1 in 6 chance of success. Other skills require training and have a base 0 in 6 chance of success. Many skills are also modified by an ability score. In this case, a -1 penalty (a score of 8 or lower) reduces the chance of success by 1 in 6, and a +1 bonus (a score of 13 or higher) increases its chance by 1 in 6. In order to use a skill, the character must have at least a 1 in 6 chance of success. Adventurer characters gain points at each level to improve their skills. No skill can be advanced to greater than 5 in 6. A character's chance of success with all skills should be noted on the character sheet. Descriptions of how these skills can be used are given in the chapter on game rules. After a year or more (I can't remember how long exactly) of only playing versions of old-school D&D, I played in a Savage Worlds game yesterday. I had a SW period a while back, both running and playing in regular campaigns, and enjoyed it for a while, before the siren's call of old-school D&D lured me back to my roots. So it was very interesting to return to my once-regular gaming system, and to look at it with fresh eyes. 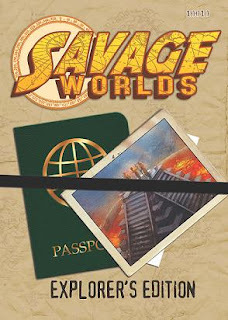 I guess I have a weird relationship with Savage Worlds now. On the one hand I basically really like the system. I find it clean and well designed, without being bland, complex enough for some nice character options, without the number crunching that comes with D&D 3, and it comes in a nice slim rulebook. I also really like the concept of a core system -- which can be expanded and tweaked for each campaign -- as opposed to generic / universal system -- which is supposed to cover everything out of the box. 1. The dice system. On paper I find the dice system in Savage Worlds really cool. Roll your trait die (a d4 to a d12) and a wild die (a d6). Take the highest then apply any situational modifiers. If you get 4 or more you succeed. Higher results in multiples of 4 (so a result of 8, 12, etc) are called "raises" and sometimes get you additional levels of success. All dice "explode", meaning that if you roll the highest number on the die then you roll again and add. A nice system. The trouble I have with it is that it can take so bloody long to resolve a single action! There's lots of different die types involved, lots of adding, lots of re-rolling (which leads to more adding), lots of comparing (the wild die and the trait die can explode separately). This is, of course, especially problematic with players who are new to the system, but even for experienced Savage Worlders the fact is that it's just a slow and pretty fiddly resolution mechanic compared to what I'm now used to (to attack: roll a d20 and look up the result on a table*). 2. The use of miniatures. Of course the use of miniatures is theoretically optional in most roleplaying games, including Savage Worlds, but SW is one of the more mini-oriented games I've come across. There's a lot of talk of things like adjacent squares, blast radii (in squares), squares of movement rate, etc etc. It lends a skirmish / wargame feel to the game (which, if I remember correctly, is actually its origin). This is fine for certain sorts of game (I'd consider using Savage Worlds for an explicitly battle oriented game, for instance), but for general roleplaying I prefer to not use minis at all, and can't be bothered with all this counting out squares of movement, ranges, and so on. The tagline of Savage Worlds is "Fast, Furious Fun!". I think this is very relative. 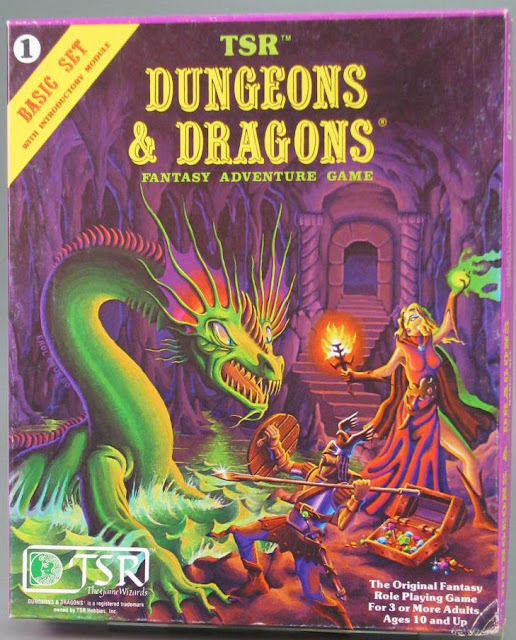 Compared to basic (old-school) D&D, for example, it's not fast at all. Compared to more modern D&D 3 derived games, I guess it probably is fast. I'd say it's about the same as 1st edition AD&D played with individual initiative, segments, the full monty. 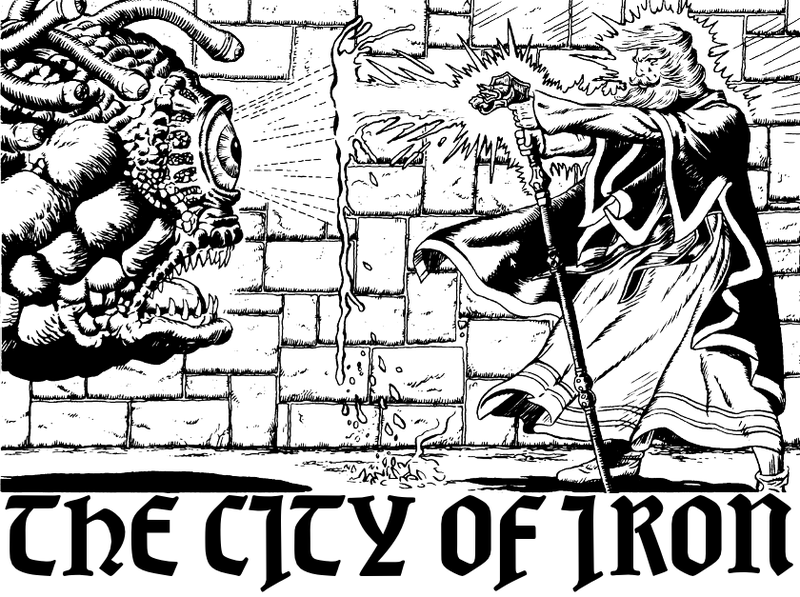 Once again I come away internally praising the glory of the sleek OD&D or B/X rules! * I'm beginning to wonder whether a simple table lookup is actually faster than rolling a die and adding a modifier. You know, one of the main proposed benefits of the ascending AC system is that it doesn't require a table lookup. It does, however, replace that lookup with an addition or subtraction of the d20 result with the attack modifier. I'm not sure that's quicker.